What problem is this piece solving for my customer? Is this content timely to my audience? 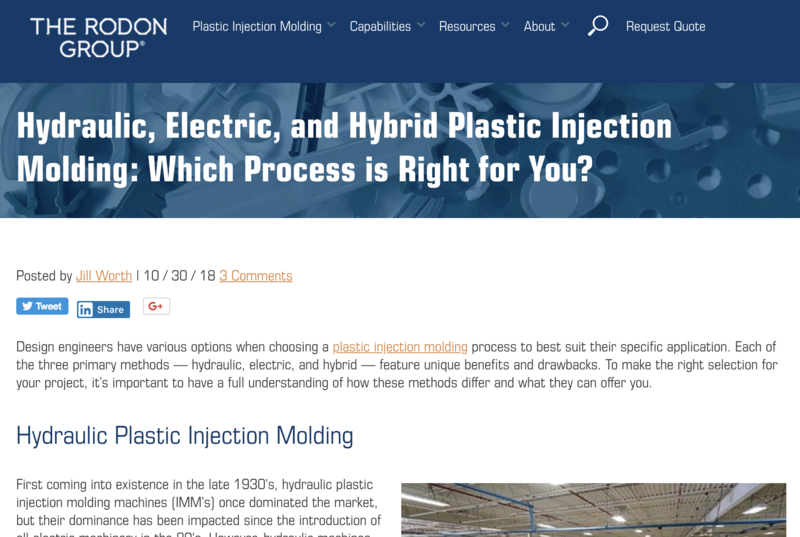 Take a look at The Rodon Group's "Hydraulic, Electric, and Hybrid Plastic Injection Molding: Which Process is Right for You?" blog post — it addresses all of those questions within the first paragraph to draw their prospects in. If you cannot identify the answer to those three questions above when reviewing your content, it’s missing the mark on relevancy — you want to bring your prospects content that is relevant to their business at the time they are reading it. Consider the information your customers give you on a day-to-day basis to identify relevant topics for your content marketing. What problems are current customers coming to your industrial manufacturing company to solve? These issues are obviously relevant as you’re helping solve them presently — bring solutions and information to the rest of your audience through content marketing. If your industrial marketing content brings no value to your prospects, reading it is a waste of their time, which has the potential to turn readers away. Your content must provide a benefit to the audience in some way. Helpful tips: What tips can your business offer customers to improve processes, their lead times, etc.? Useful advice: Give your audience information they can use right away, implementing positive change within their businesses. Practical advice: What have you learned through everyday business or about your industry that would be of value for your audience to know? When your content is valuable to your prospect, they more easily see that your business is committed to providing them value, building an additional trust and education component to the relationship. No one wants to read the same thing they’ve already read before. If your content isn’t unique, it isn’t relevant or valuable to your prospects. With your content marketing, you cannot simply echo what others are saying or doing — it’s not different! Your content marketing must offer a fresh perspective or new insight. You can discuss the same topics others are in their marketing, but your piece must offer something different that the others do not. 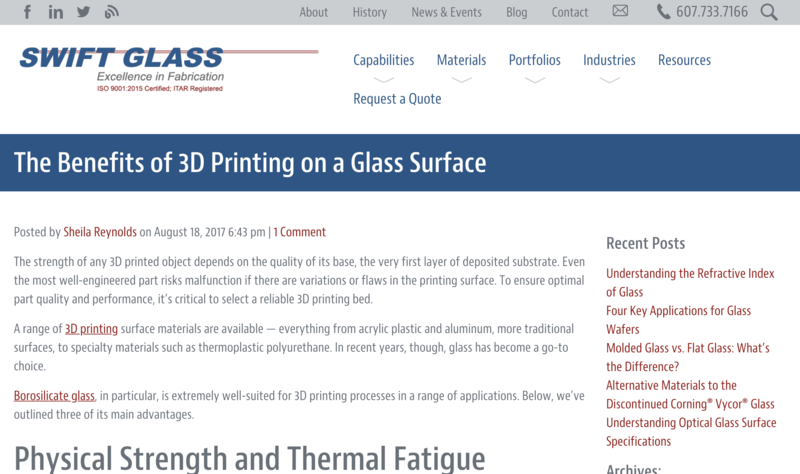 Give your readers something they won’t find from other industrial marketing pieces — like Swift Glass's "The Benefits of 3D Printing on a Glass Surface" post. Another point to touch is avoiding duplicate content. Although you may cite or reference other articles, you should never copy and paste more than 10 words (assuming you link back with credit to the original source). Plagiarism isn't a good look — and it also does damage to your online reputation. Details are a distinct difference between different types of content marketing. Quick takes and snippets are best suited for sites like Twitter, but your website, blogs, and eBooks need to be more in-depth to hit the quality criteria above. Your website pages and blogs should be at least 500 words. This length provides ample opportunity for detail, plus allows you to avoid SEO penalties for thin content. The value, relevancy, and uniqueness of content marketing for manufacturing companies is in the details. If you confidently agree your content meets the four criteria above, it passes the quality test for industrial marketing. When your content misses one of these markers, you’ll know what you need to target through revision to create quality content that offers improvement in manufacturing sales. Interested in learning more about content marketing? Download our eBook, Content Marketing for Industrial Companies, today.